Luxury cottage edge of Lyndhurst -fabulous views! Perfect romantic getaway or ideal base for a family holiday-10 minute stroll to Lyndhurst village and amenities,watch the visiting ponies from sofa! 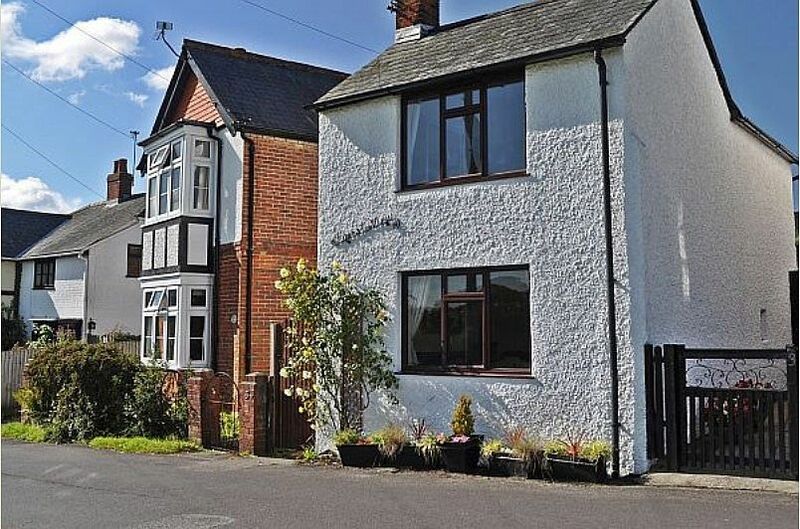 This cosy cottage in Lyndhurst offers one double and one twin bedroom, (with the option to become a kingsize bed) there is also space for either a fold out bed for a child (up to 12 years) or a cot. The cottage has been beautifully modernised with bright rooms and ample space for a family or friends. An open fire allows you to snuggle up in winter while watching ponies from the window, creating a relaxing holiday atmosphere. The views of the forest are ever changing, with the comings and goings of ponies, donkeys & cows that will come to drink from the water trough just opposite your holiday cottage. By the end of the week you will recognise the 'regulars' with their foals and may catch glimpses of deer in the evening and early mornings. Forest View cottage is the perfect based for either a relaxing break or a fun filled adventure in the New Forest. Being walking distance to everything you need, you can explore without a car using the New Forest tour bus (June to September)www.thenewforesttour.info, walking or cycling on the 200km of cycle tracks. Lyndhurst village offers a variety of independent shops and boutiques, vintage shopping, as well as a supermarket, butchers and fishmongers. Eating out is well catered for wander into Lyndhurst and choose from Italian, Chinese, India or Thai cuisine. Or maybe a traditional home cooked meal from one of the may Forest pubs within the village are more appealing; enjoy the lovely beer gardens in summer or cosy fireplaces in the winter. The cottage has every creature comfort to make your stay easy and relaxing. You can venture far and return to a cosy fire in the winter or relaxing Jacuzzi bath to ease out tired muscles. Alternatively for the less active or those simply wanting to enjoy the atmosphere, enjoy watching the ponies from the window with a lovely cup of tea and piece of cake. Maybe stroll up into Lyndhurst village for afternoon tea followed by some vintage shopping and brows around the independent shops. Don't forget a few moments dreaming in the Ferrai and Maserati show room and a trip to the old fashioned sweet shop! Before returning for a traditional home cooked meal at The Waterloo Arms pub, just a 2 min stroll from the cottage. Our delightful cottages provide a special place to take time out for you. We can include retreat packages during your stay which can include holistic therapies and walking coaching in the beautiful New Forest. All of our programmes are designed to improve physical, mental and emotional wellbeing. We love our holidays as this is when we manage to spend quality time together, having fun and building happy memories. It therefore seemed sensible for us to buy a holiday home as over the years we believe we have learnt what is needed for a great holiday. We have travelled the world, but love returning to the beautiful New Forest. We moved to Ashurst in 2000 and have enjoyed exploring the ancient woodlands, local villages and attractions with our 3 boys. We work in the New Forest and enjoy regularly walking and cycling around the Forest enclosures. Our sons have been brought up close to nature learning about the seasons while hiking through the Forest looking for fungi, climbing trees with friends, building dens and starting their own adventure with the great outdoors. We bought Forest View cottage in 2010 after the whole family fell in love with the fabulous view from the cottage over the Forest lawn and visiting ponies. The attraction to our boys aged 11, 9 and 7 at the time, was the adventure of the Forest, rope swings, streams and building dens! To Ramsey and Donna being at Forest View cottage really feels like you are away from it all, yet you are only a few minutes’ walk from Lyndhurst village and the great range of shops and restaurants, old fashioned sweet shop and Ferrari garage. We set about fully renovating and cottage whilst retaining the many character feature. Today the property is light and airy with luxury fittings and comforts throughout. We find Forest View simply a great place to unwind and spend quality time together. If you want the hubbub of the beaches and villages of the New Forest then they are on your doorstep, if not you have all you need for a great week away spending time together and getting close to nature at Forest View cottage. We enjoy all seasons at Forest View watching the new foals frolicking in spring, picnics in summer, searching for fungi and watching the pigs graze the Forest in autumn, and snuggling up round the fire after a long crisp walk in winter. With Lyndhurst’s great range of little shops just a few minutes’ walk away and the Golf course even closer there is something for everyone! We hope you enjoy your time here as much as we do. Luxury bathroom with marble surrounds. Jacuzzi bath with drencher shower, attachment and glass shower screen. Wash basin with storage under. WC, heated towel rail. On ground floor. Sitting room with open fire and stunning views of the New Forest. Flat screen 32" T.V, DVD and Freeview. Dining Room. Oak extending table and leather diners, desk,Wi-Fi, IPOD docking speaker system, telephone for incoming calls. Toys and family games. Modern fitted kitchen, galley style, fully fitted with oak surfaces, Belfast sink, dishwasher, gas hob, electric fan oven, under counter fridge with ice box. Washer/dryer, ironing board and iron. Secure bicycle store. Bicycle hire in the village. Notes on accommodation: We have a selection of family games and books at the cottage. A few children's toys and jigsaws to keep the little ones entertained. Outside: There is a pretty garden at the rear of the cottage with sunny patio area to the rear, with charcoal BBQ and lockable store for bikes. Parking for two cars to the front of the cottage. Cleaning / Towels / Linen / Maid service: Includes all bedding, towels (excluding beach towels), all utilities. Bundle of logs in winter and BBQ coal in summer. Other: There is a fold out bed that can accommodate a child up to 12 years old. This fits best in the twin room. We can supply a cot (you bring the bedding) and highchair upon request. There is a lockable bike store in the garden. The cottage was lovely,clean and welcoming. Me and my young family had an amazing stay and would highly recommend Forest View Cottage, my 5year old daughters favourite part of the holiday she said was waking up to watch the ponies outside the window! The Cottage is a short stroll into the centre of Lyndurst with pubs and restaurants and shops. We enjoyed cycle paths through the new forest and Paultons Park was brilliant for the kids. We did the scenic walk straight from the door across the field to get to Boltons Bench and walked back through the centre of Lyndhurst for a nice stroll with the kids. The cottage was fantastic, clean and tidy with everything we could need. Thank you Donna and Ramsey for letting us enjoy your holiday home, i'm sure we'll be back! Also thank you for the welcome and the lovely homemade cake, we all enjoyed it!! We really enjoyed our stay at Forest View cottage. The cottage was exactly as we hoped: wonderful views of the forest and especially the animals and easy walking distance to visit the forest and Lyndhurst, as well as the excellent Waterloo Arms pub across the street. The cottage itself is beautifully clean and well-appointed, with enough space and dishes/glasses etc for us to comfortably host a 15 person barbecue (even champagne glasses!). Donna is lovely and her famous Victoria Sponge cake surpassed its reputation for deliciousness. What a nice touch as well to arrive to find that our temporary home was already equipped with tea & milk to enjoy with our cake. Thanks for a lovely stay in the New Forest!! Beautiful cottage with fabulous views. We enjoyed a lovely long weekend in this beautiful cottage. The cottage itself was well appointed with plenty of room and was very tidy. There was a very nice BBQ in the back yard which we used. The views were stunning with horses and cows continuously walking by the window. The village was 5 minutes walk and well worth a visit. Well recommended. We (2 adults and 2 children) have just finished our 2 week Christmas stay at Forest View whilst I worked at The Nuffield Theatre. It was perfect for us ; open fire, views of countryside and ponies, plenty to do and easily accessible by public transport (we don't run a car). The kids made use of the games cupboard on rainy days and enjoyed stomping around in the mud and meeting the ponies. I really enjoyed waking up and seeing green and ponies (a good antidote to our usual London street view!) before catching a bus into Southampton. There are, of course, plenty of walks and bike tracks (bike hire in the village) - we hope to make more use of them on a return trip! Donna was very welcoming, helpful and on hand if there were any problems. The cottage had everything we needed and was really lovely to stay in. Geographically it is really well placed and you could easily get to all sorts of places with a car. Even so, without one, there are still buses down to Lymington and easy to get a train from Ashurst or Brockenhurst or Southampton out to other places. On New Year's day we were on Avon & Mudeford beaches - just 25 mins away by car. The Waterloo Arms, just across the road, was a very welcoming family friendly pub for food and a roaring fire (my daughter was delighted that it looked like the Gryffindor Common Room!). Also, The Fox and Hounds on the high street was a nice place to pop in for an early evening drink as a family. We had a great curry delivered to the house (I think it was The Curry Leaf - can't remember!) and there are LOTS of little eateries in the village. The village looked delightful all lit up at Christmas and was very exciting for our children. We hope to return again, when we're not working, to make full use of the lovely walks and bike rides. Forest View cottage is an ideal base for exploring the New Forest. With Direct access onto the Forest it is perfect for a walking holiday. Access to the cycle tracks is less than a mile away. With all of the visiting ponies it is an ideal spot for painting and photography. Yet only a short stroll from the village and a well deserved afternoon tea! All of the New Forest Tour buses stop in the main car park in Lyndhurst and run from June - September. Jump on jump off the buses that travel around the whole of the New Forest with fascinating running commentary about the Fauna, Flora and History of the Forest. Lyndhurst - 10 mins walk. New Forest Visitor Centre and museum. Independent shops, cafes, restaurants, old fashioned sweet shop and Ferrari showroom. Furzey Gardens, Minstead - 5 mins. Gardens, with fairy trail, tearooms and artists studios. Longdown activity farm, Ashurst 10mins - Feed the animals, trampolines, ball pits, tractor rides. All weather. Nearest Shop. Lyndhurst village, about a ten minute walk. A small Budgens supermarket, good butcher, chemist and numerous other small shops. Local eating out: excellent choice of restaurants, cafés, from the top notch Lime Wood to Italian, Indian, Chinese, Thai and much more, plus traditional Forest pubs all within the village and walking distance from the cottage. Forest Walking: Endless walks from Forest View where the open New Forest stretches before you. A gentle amble or a stroll via the water meadows on route to Matley woods. Venture down Oriental Drive to Bolderwood and the Deer Sanctuary see if you can spot the white stag! Lots of circular routes on gravel tracks suitable for buggies, cycles or those a little less sure on their feet. There are facilities, including the ice cream van Bolder wood! Maybe stop at Blackwater Arboretum on the way back or visit the 500 year old Knightwood Oak? Nearest little towns: Within a 25 minute drive, Lymington, set by the Solent, Marinas, cobbled quay and excellent Saturday street market. Isle of Wight ferry. Big Town, Southampton, about a twenty minute drive from the cottage. Historic Town. Romsey, lots of independent shops, good restaurants. About a twenty minute drive. Riding at Ford Farm Stables at Brockenhurst. Bike hire. AA Bike hire Lyndhurst or Cycle Ex at Brockenhurst. Mr Spokes at Ashurst. Access to over 200km of designated cycle tracks that radiate across the forest. Beaulieu Village, Palace House and the Motor Museum. Forest View has its own visitor guide to make the most of your holiday. Booking Notes: Please contact owner. You will be asked to complete a booking request form. Once completed we will make a provisional booking. We will then request a 30% deposit payment within 7 days. Once received your booking will be confirmed. Your balance payment will then be due 8 weeks before your holiday. THE OWNERS REQUEST NON SMOKING GUESTS ONLY. Changeover Day: During busy times the changeover day is on a Friday. At quiet times we can be flexible. Arrival time: 3.00pm. Departure time 10 am. Friday start day for 3 night weekends available out of main season. Please enquire for availability.